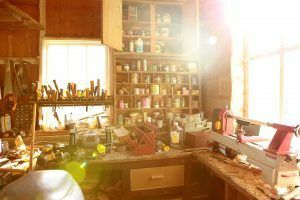 Men in Sheds is exactly as it sounds, a shed known as the Old Joiners Workshop where men can seek friendship and pursue their practical interests. It’s a larger version of an ideal garden shed, located by the very beautiful, but secluded, Caldbeck Pond. It’s accessed by residents from the local area, often with the help of volunteers due to their age and isolation. Stepping inside you will discover a friendly, safe and inclusive environment where members share tools and resources to work on projects of their own choice at their own pace. One member Bert, who is 90, and would normally be very isolated and alone, said: “I live for Tuesdays and Thursdays.” The atmosphere is welcoming and warm as the sun shines through the dusty windows and the smell of bacon butties and warm wood fills the air. This is the place to be if you want to enjoy the companionship of likeminded and caring friends. An absolute need in this area for people like Bert, where issues including fuel poverty, and lack of facilities, services and transport affect them. The project meets twice a week and has more than 30 regular attendees. It not only provides respite for carers but a refuge for older men – some with early onset dementia. They also repair notice boards, vintage motorbikes and playgrounds. Their latest activity is making benches for Cumbria Wildlife Trust. The vast number of projects, managed by Northern Fells Group, has received more than £122,000 in grants administered by Cumbria Community Foundation since 2004. 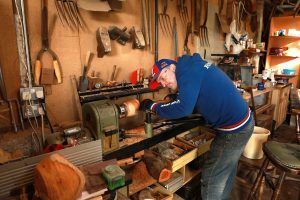 The Men is Sheds project continues to go from strength to strength. 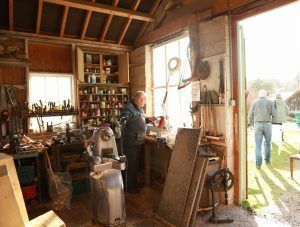 The Shed Master, Ken Graham and volunteers are self-admitted ’a bunch of big kids in old bodies.’ The members also support their local pub and meet every week with family members to have tea and a catch up. Northern Fells Group is a community owned and volunteer led charity. Covering 200 square miles of upland terrain where 4,000 residents live, work and play who can also be vulnerable, isolated and excluded from vital services. 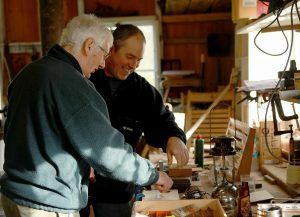 To respond to needs of the local community, the charity developed a range of services in addition to Men in Sheds, including a community minibus, a Village Agent service, a Lend a Hand scheme, benefits awareness advice and holiday play schemes, along with social and recreational activities. Over its time the group has helped many people. One gentleman has lived in the village since he retired from farming. Over the last few years, he suffered from high levels of anxiety, which meant that phone calls and any letters or bills caused a great problem. Small things easily overwhelmed him and he lost confidence in himself. 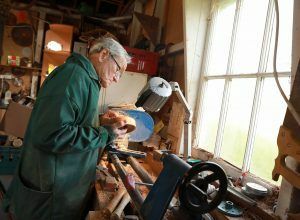 The group provided social activities for him to attend on a regular basis such as Men in Sheds, where he was a regular for many years until going into a care home. He also attended lunch groups and other social activities run by the NFG. The Village Agent assisted him with ordering household aids and with sorting and filing bills and contacting utility providers. He used the minibus regularly when he gave up driving. He also used the Lend a Hand service to fit bathroom aids for safety. Libby continues: “Residents face day-to-day issues like poor or no public transport, poor health and loneliness, and low incomes stretched by rising fuel prices. New people to the area and long term residents often don’t have family support networks.